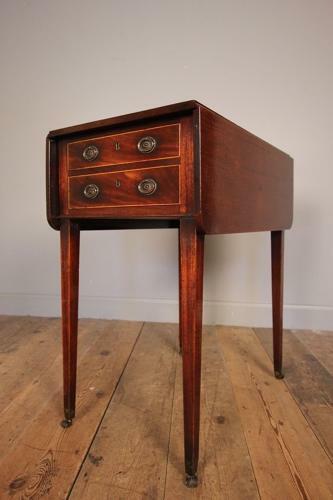 A fine quality Sheraton period Pembroke table, made in solid Mahogany with rich patina and original finish. This small proportioned table having 2 drawers of which retain the original gild and chased handles, locks and escutcheons. Raised on tapering legs which retain the original brass and leather castors. Superb untouched condition throughout. English, Circa 1785. Dimensions: Height: 73.5 cm - 29 Inches, Width min: 42 cm - 16 1/2 Inches, Width: max: 85 cm - 33 1/2 Inches, Depth: 62 cm - 24 1/2 Inches.